I love books that keep me on my toes and keep me thinking. I love books that have moments that make me scream, "I KNEW IT!" victoriously. This was the case last weekend as I was reading The Eternity Cure, the sequel to The Immortal Rules, both of the Blood of Eden series by one of my favorite authors of all time, Julie Kagawa. I sat down on the couch on Friday night last week with a couple of blankets, my book, and my three dogs, all cuddled up and ready to settle in for a long weekend of reading. And three times in one evening, I shouted "I KNEW IT!" with such excitement that it startled all three dogs out of a sound sleep once and made one of them bark, thinking I was in some sort of trouble and yelling for help. I've long been a fan of Julie's books. From the first book of the Iron Fey series to her most recent endeavors, I'm constantly enchanted and amazed by her writing. No matter how many times I read a book she's written, I come away in complete awe of the story she's crafted and of her talent. Julie is weaves her stories so carefully, gradually working you into a spell. She's a master at careful foreshadowing and hinting at things to come. This book was full of moments that I sort of knew were coming, that I got stronger and stronger inklings about, and yet still managed to surprise me. It was full of "I KNEW IT!" moments, along with, "OH MY GOODNESS!" and "I CAN'T BELIEVE IT!" moments. I have to apologize to my readers at this point in the review -- it's about to get a little spoilery up in here. But the spoilery portions of the review will be highlighted in blue and have white text. Scroll past them without reading if you do not want to be spoiled. Here, she came to find that what was left of Kyle's gang, her gang's former frenemy gang, was living underground with a new leader after Kyle had succumb to new form of the Red Lung and rabidism virus that was now shaking up both the fringe and New Covington, causing the Inner City to go on a full lock down. During this time, she and Jackal came in contact with a boy who went by the name Roach and was part of this new underground gang. They forced him to lead them underground and bring them to their leader, who supposedly knew the inner workings of the underground system better than he. We kept hearing about this new leader, this new force who was uniting the remaining fringers and helping them to at least stay temporarily secure and survive as a new disease threatened to wipe out the remaining humans of New Covington. As he kept hinting to this new leader, I kept thinking to myself ... "Could it be Zeke? Is it him? Is it Zeke? It has to be Zeke, right?" And sure enough, it WAS Zeke. This was one of the moments where I jumped up from my seat and scared the living daylights out of my dog. Once Jackal had demanded to see Prince Salazar, posing as an out-of-towner in hopes of gaining access to highly restrictive vampire tower where they believed that Sarren had taken Kanin to be held, they kept hearing about Salazar's new aide. A man by the name of Mr. Stephen. And I thought to myself, "We know Stick was the informant. No one had seen him since he had run from the gang and ratted Allie out. Stephen starts with the same two letters as Stick. Could it be Stick? It has to be Stick!" And once again, I was RIGHT! These weren't the only sort of scavenger hunts that Julie led us on through this book, through this maze of discovering old ties and also uncovering treachery of the worst kind. But they were some of my favorites. And I just loved the journey she led us on. I loved the feeling of having this gnawing feeling in my gut that someone or something else from their past was about to be thrown at them in a way that they didn't suspect. I just loved it. And Julie is one of a kind in this area. She really is able to take you on the BEST journeys. Whether it's vampires or fairies or, as I'm about to find out in her new Talon series, dragons, she just draws up the best plot lines that really make you think. I feel like her books make me travel, like I'm stomping through the trenches or the Nevernever or the rabid infested New Covington. I get a feeling when I read her books like no other. When you hear that cliche (that I believe to be totally true) that books can transport you to somewhere else, Julie's books are the FINEST EXAMPLE OF THIS THAT I KNOW. Hands down. 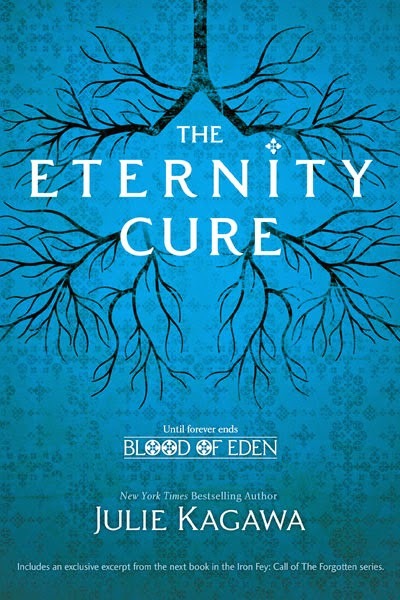 And The Eternity Cure was no exception and in my opinion, her best book to date in that regard. Another thing I loved about The Eternity Cure and the entire series through to this book, really, is Kanin's character. I LOVED his strength. Here this guy is, he gets this horrible mutated virus that is making him rot from the inside out, but he is still the picture of cool, calm, collected, and a master of strategy. He is constantly the wise sage. And he still fights like he's got it all in him, even when you know he doesn't. I love Kanin for the same reasons I love Albus Dumbledore. I revere him in the same way. 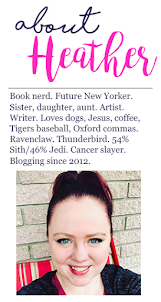 And if you know me and know how much I love Harry Potter and Dumbledore, you know that this is one of the highest compliments I can give a character. I just have so much love and respect and awe for him. And again, this is just another testament to Julie's writing -- she makes you respect a character and wish you could learn about life from him. That's awesome. There were only two little downsides to this book for me and they are so, so minute. Stick. Okay, I get that he was kind of always a bit of a scaredy cat and a wild card, and I get that a lot of his behavior is due to his fear of Allie and also, I believe, quite a bit of jealousy. But his behavior was just so beyond erratic. I would've gotten and understood one of his outbursts. But no. He was just coming back for more. And by the end, I was glad he got what he had coming to him. I really wanted him to either be redeemed or just shut up. I guess at the end he was finally shut up. But I could've done without one or two of his strange outbursts and attempt to look like he was the man. And at the end, I know Allie, Jackal, and Kanin think Zeke is dead. But he's totally not. I mean, I knew from the instant that I heard the recording that there was no way that twisted, conniving, but also brilliantly strategic Sarren would leave Zeke for dead when he could turn him and make him the ultimate tool for revenge against Allie and also create a huge roadblock and problem for Kanin. So I don't feel like the ending had the suspense it could have. I feel like the recording actually took away from the suspense a little bit. Like, I think he could've just left some other sort of "proof" Zeke was dead. We still would've suspected. But I felt like the tape was overkill. And the end scene where we knew Zeke's body was still with him, I think it would've been more suspenseful without that. But again, those things are really, really minimal in a book that otherwise swept me off my feat. If I had a graphic for 4.75 out of 5 hearts, that's what I'd give because it's so small. So know that this rating is officially 4.75/5, but I just don't have the graphic for it. Go out and buy the first two books in this series. Expose yourself to Julie's brilliance. You'll be a happier person and a better reader for it.